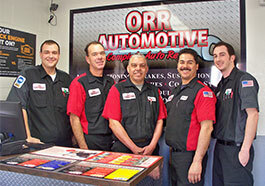 If you have a classic car or truck, Orr Automotive serving Montclair, Claremont, La Verne, Upland, Ontario, Pomona, Rancho Cucamonga, and Alta Loma can retrofit your high performance vehicle with all of today's technology like fuel injection, turbocharging or supercharging, 4-wheel disc brakes, electronic exhaust switches and a custom exhaust system. Adding gears in your hotrod can give you best results for the best value. For newer vehicles, our shop technicians can provide custom performance chips that are specifically programmed for your application. Finally, our chassis dyno allows us to custom tune your vehicle.